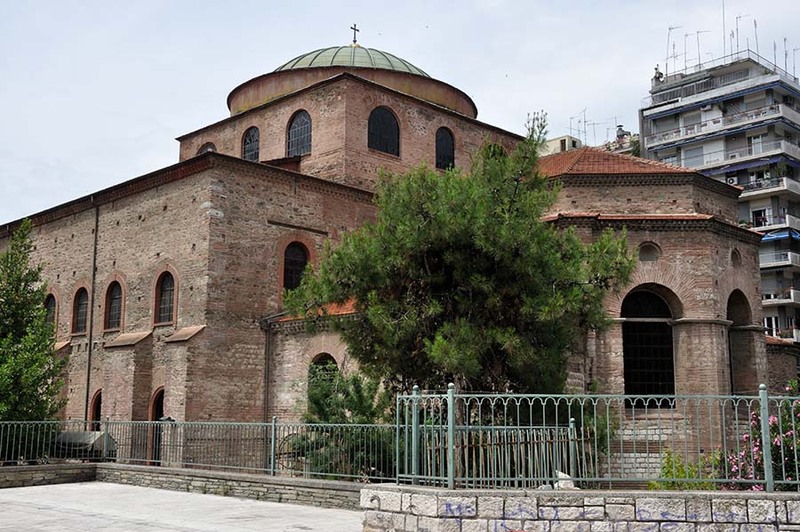 History – Name Origin: The Church of Agios Nicolaos the Orphan (Orphanos) is situated in Ano Poli of Thessaloniki, at the end of Apostolou Pavlou Street, in the eastern side of Irodotou Street. It was founded in the second decade of the 14th century as a catholicon, from which only two columns and the entry porch still survive -apart from the catholicon. There are different versions concerning the identity of the founder of the monastery but according to the dominant one, he used to be the Serbian king Miloutin. As far as the name of the Church is concerned, the temple is referred in 17th and 18th century documents as “Agios Nicolaos the Orphanos” as well as “Agios Nicolaos of the Orphans”. This name has to do with the charity action of Agios Nicolaos (concerning the orphans) or it refers to the existence of an orphanage within the monastery's area. The Church was never transformed into a Muslim mosque but it used to be a “property” (metohi) of Vlatadon Monastery. 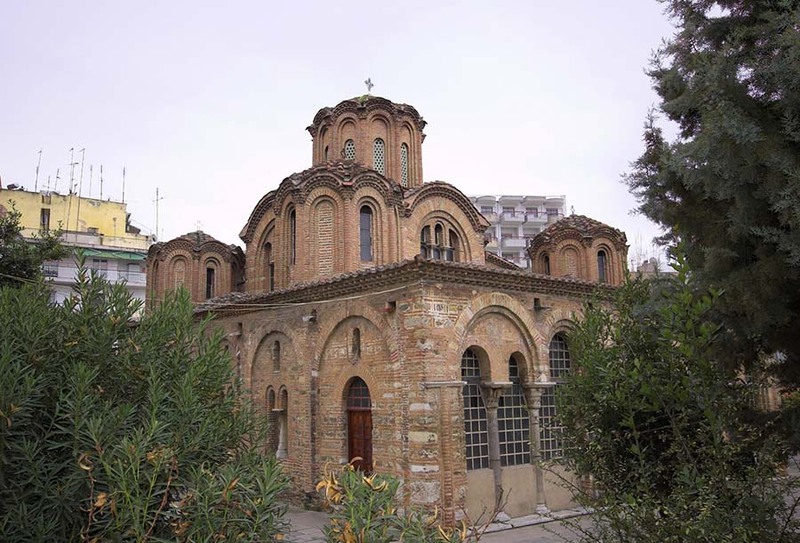 Architecture: The Church of Agios Nicolaos the Orphanos has not survived in its initial form(three- naved basilica). In its actual form, it is a single wooden roof basilica, surrounded by an ambulatory on its three sides. The central space is covered by a gabled roof while the ambulatory is covered by a lower single surface roof. In the east, the ambulatory ends in two niched chapels, while the central temple ends in a tri-part Holy Altar and communicates with the ambulatory via two open arches ( in its eastern and northern part) and an entrance (in its western side). The two bi-valvular openings are being supported by two marble columns that contain “theodosian” paleochristian capitals. Ιt is worth to mention that that the marble temple of the Church is contemporary with the initial Church itself. 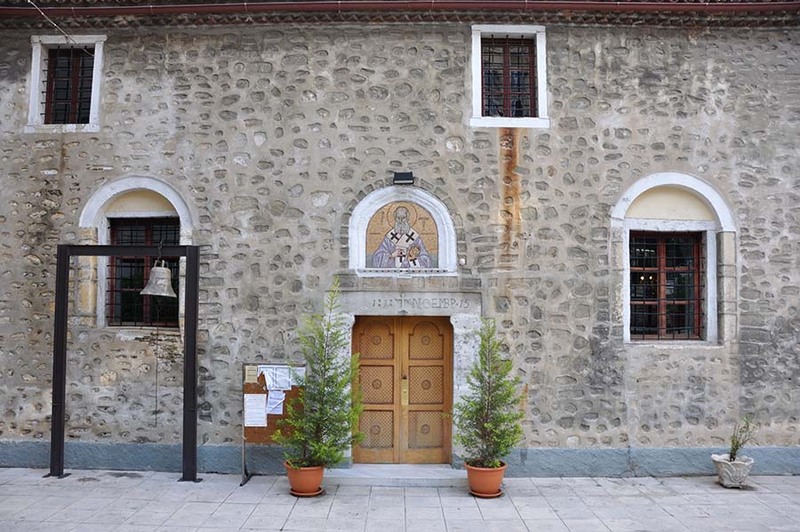 The wall building of the temple is simple and lacks a voluptuous ceramic decoration in contrast to the other Paleologeian Churches of Thessaloniki. Wall decoration: The temple’s interior is almost everywhere decorated with well preserved murals and inscriptions of the early 14th century (1310 – 1320 A.D) that belong to the most characteristic samples of Paleologeian painting. The wall decoration is organized in successive zones. In the main area of the temple, we can see depicted images of Saints, scenes from the Dodekaorton, the Passions of Christ as well as His Resurection. The narration of the Akathistos Ymnos in the northern part of the ambulatory as well as the scenes from the Old Testament, the Miracles and the Biography of Saint Gerasimos in its southern part are also worth mentioning. Scenes from the Biography of Agios Nicolaos also survive in the narthex. In the quarter of the Holy Altar’s arch, Panagia is depicted praying with Angels above her and underneath her there is a depiction of the Holy Liturgy. The wall decoration of Agios Nicolaos the Orphanos is also known for its powerful synthesis, its richness in colours as well as its interesting theme selection.